The transition between seasons—at least here in the northeast—can make for schizophrenic mealtimes. One day it’s warm and we’re eating a light, refreshing dinner salad, the next it’s rainy and cool and we’re cozying up with this classic Baked Ziti. Some comfort foods only feel right in the winter, while others are great all year around. I rely on the all year ‘round kind to help me make the switch from winter to spring or summer to fall. They are simple, classic dishes that remind you of when you were young. They are made with ingredients available whenever. They are family food all-stars. And my favorite of these go-to dishes is Baked Ziti. Pasta with meat sauce is good. But pasta with meat sauce baked with ricotta and mozzarella is great. Baked ziti is indeed an all-star dish, as good in the dead of winter as it is on an early spring day. 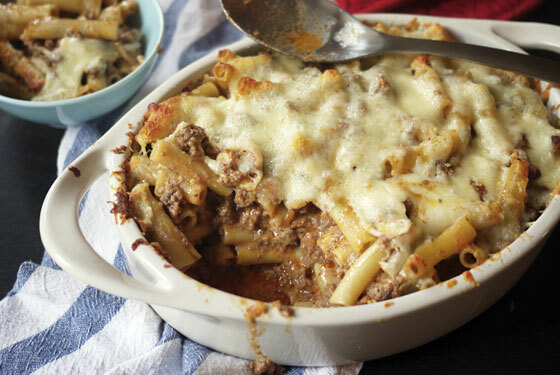 If you know that you will be short on time, prep your baked ziti ingredients ahead. Pre-cook the pasta (check out the great how-to!) and make your sauce up to two days in advance. Then all you have to do on baked ziti night is assemble and pop it in the oven. Otherwise, you can put this together all in one shot: make the sauce while the pasta cooks, assemble, and bake. If you’re going to make the whole thing in one shot, but don’t have time to cook a sauce from scratch, brown meat with onions and garlic and add a high-quality, all-natural jarred sauce—it will cut cooking time in half. However you make this, look at what you end up with! 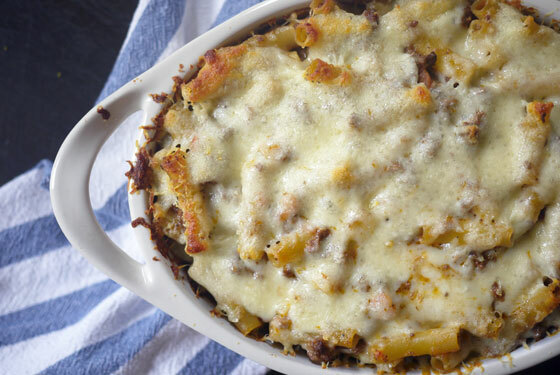 Nobody can resist baked ziti… any way you make it, any time of year, any kind of weather. 1. Preheat oven to 400 degrees and butter a 2-quart baking dish. In the meantime, bring 1 gallon of water seasoned with 1 tablespoon of salt to a boil. Add pasta, stir and cook until pasta is very al dente (this should take about 4-5 minutes fewer than the time directed on the package). Drain, saving ½ a cup of the cooking water, and set aside. If you are cooking your pasta ahead of time, get further directions here. 2. Combine pasta with meat sauce and ¼-½ cup of reserved cooking water, depending on how thick your sauce is. (The pasta cooking water contains starch that helps the sauce cling to the pasta. You don’t need a lot, so use it sparingly; you don’t want to water down your sauce or make it too thin.) Set aside. 3. Combine ricotta, egg, ¾ of the Parmesan and ½ of the mozzarella. 4. Pour pasta in your prepped baking dish and dot with ricotta mixture. Sprinkle with remaining Parmesan and then with remaining mozzarella. Place baking dish on a rimmed baking sheet and bake for about 20 minutes, until sauce is bubbling and the cheese is golden brown.